Somehow, George Augustus Polgreen Bridgetower did not go down in history. After a meteoric, early 19th-century rise – tied to a rocky creative relationship with Ludwig van Beethoven – the Afro-European violin prodigy was promptly forgotten. But he has since been rescued from obscurity by Pulitzer Prize-winning Poet Laureate Rita Dove in her acclaimed book, Sonata Mulattica. And at 19, contemporary African-American violinist and composer Joshua Coyne has the talent to share center stage in a new documentary that spans two centuries of struggle. George Bridgetower and Joshua Coyne never met, having lived on separate continents at very different times. Yet they share an exceptional bond: a musical gift transcending racial boundaries and defying all expectations. Linking contemporary artistry to classical virtuosity, the documentary Sonata Mulattica combines Dove’s dramatization of a lost virtuoso’s thwarted ambitions with a character-driven exploration of his modern counterpart, Coyne, a new prodigy of similarly humble beginnings and extraordinary potential. With Rita Dove as literary muse, two remarkable lives are imaginatively interwoven into one artful tale. Bridgetower, born to servants of Prince Nikolai Esterházy in Biala, Poland, showed great musical talent at a very young age. After debuting in Paris at age nine before an enthralled audience that included Thomas Jefferson, he went on to astound Ludwig van Beethoven with a performance of the “unplayable” Kreutzer Sonata. Thus began a tumultuous artistic collaboration that would ultimately push Bridgetower into relative obscurity until the day he died. Two centuries later, across the Atlantic in the American Heartland, a single white mother adopted an African-American toddler weighed down by a full body cast and 18 broken bones. 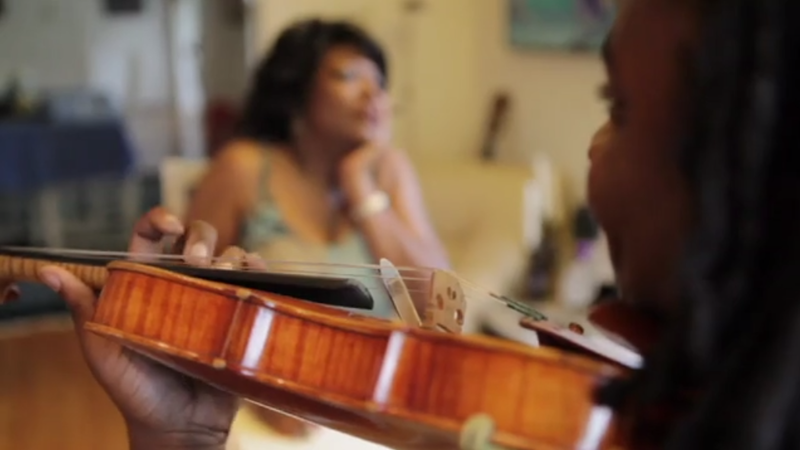 To soothe her new son, she played an aria by Puccini. He promptly hummed it back. So began the career of Joshua Coyne. By age four, he was studying violin; by eight, playing professionally and mentored by Itzhak Perlman and Marvin Hamlisch; and at 14, performing before then-Senator Barack Obama and a crowd of 13,000. Now studying composition at the Manhattan School of Music on a full scholarship, Coyne finds inspiration from Bridgetower as he confronts his own stereotype-defying destiny in an elite classical music world not so different, in some ways, from its 19th-century incarnation. As the stories of Bridgetower and Coyne unfold side by side, weaving history with contemporary artistry, the film becomes a mesmerizing musical journey infused with meditations on issues of identity, passion, race, cultural belonging, and historical legacy. Sonata Mulattica reveals how music and art have the power not only to open our hearts, but transform our lives. Sonata Mulattica is currently in production.